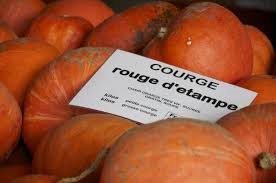 Sunday 2nd October 2016: Fête de la Courge from 10am to 6pm at the Ecole primaire in Corsier (route de Corsier). This pumpkin festival features a scrummy local produce market with oodles of pumpkins, of course, as well as sausages, artisan bread and beer. 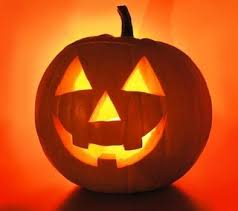 The little ones can take part in kids activities and buy pumpkins for carving. Saturday 15th October 2016: Scary Night at the Castle at the Château de Chillon in Veytaux near Montreux (VD). 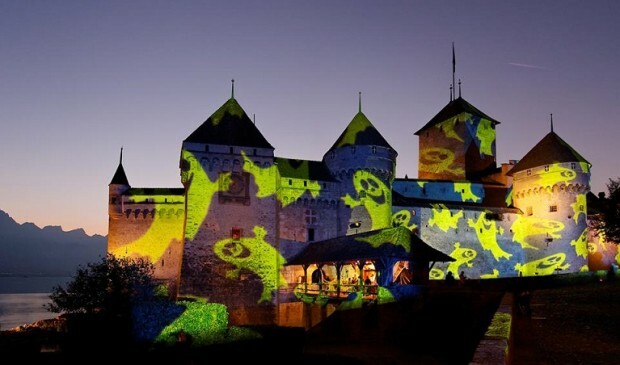 From 5pm to 11pm your little night owls can take part in this night-time adventure at one of Switzerland’s most breath-taking medieval fortresses. The castle will be lit with torches and filled with music, scary activities and a ghostly light installation on the castle’s walls by light designer Gerry Hofstetter. Entry is 15CHF per person or 35CHF for family tickets, free entry for children under 6. 20th October-2nd November 2016: Halloween Party at C l’Aventure indoor play centre in Annemasse (France). There will be various Halloween activities throughout the month of October but for a proper Halloween night party make sure you are there on Monday 31st of October from 7.30pm until 11pm, ready to be spooked! There will be magic shows, scary face-painting, a vampires ball and much more. Click here to see our previous post about C l’Aventure. The children can bring their accessories if they want. 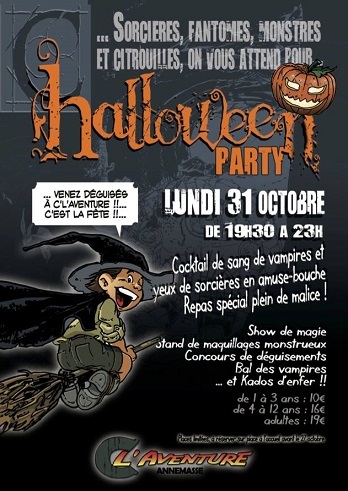 28th October 2016: Halloween Family Party organized by the Sou des Écoles des Grands Chênes – Prévessin-Moëns (France). The party will take place at the Salle Gaston Laverriere de Prevessin- Möens (France) from 6.30pm until midnight. The event will include fun and scary activities, a Halloween costume competition and much more. Entry tickets are 2 euros per child, 3 euros for parents who dress-up in Halloween costumes and 5 euros for parents who don’t! 28th & 29th October 2016: Special Accrobranche Nocturne to celebrate Halloween at the Parc Aventure des Evaux in Geneva. If the weather is good, put on your scariest Halloween costume and join other monsters from 7pm to 11pm with no advance booking required. Suitable from ages 7+. Saturday 29th October 2016: Children’s Costume Parade in Château-d’Oex (Pays-d’Enhaut). A colorful parade and witches story-time for kids are the centrepiece of this great family event. The day’s programme will include pumpkin carving workshops and clown performances from 11am, followed by the kids parade at 5.30pm and giant afternoon snack for all at 6pm. FREE ENTRY, Château-d’Oex is 140 km from Geneva. Saturday 29th October 2016: Fête de la courge at the CPO Ouchy in Lausanne (chemin Beau-Rivage 2). 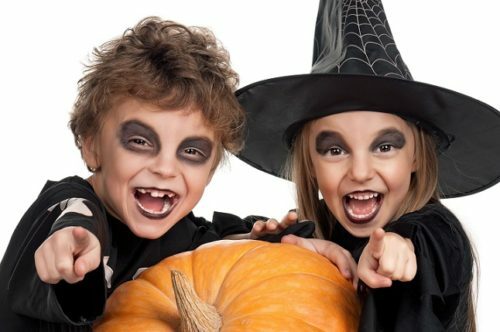 From 4pm until 8pm pumpkins and all things Halloween will be at the heart of this great family event: enjoy the spooky face-painting sessions, pumpkin carving workshops, games, ghosts train and more fun activities for children of all ages. FREE ENTRY, but workshops and activities will require a nominal fee between 1CHF and 5CHF. 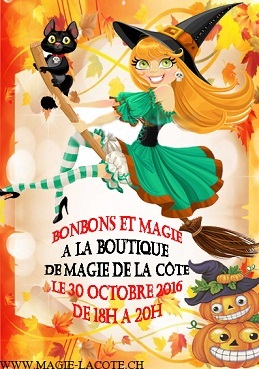 Sunday 30th October 2016: Halloween chez le Centre de Magie de la Côte. Join in this magic evening of magic tricks, sweet treats and more at the Centre de Magie de la Côte in Nyon (Chemin Falconnier 23). The event will run from 6pm until 8pm. 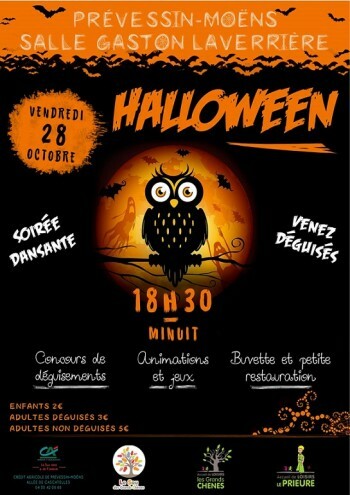 Sunday 30th October 2016: Halloween Party at the Parc Pré Vert – Signal de Bougy in Bougy-Villars (VD). 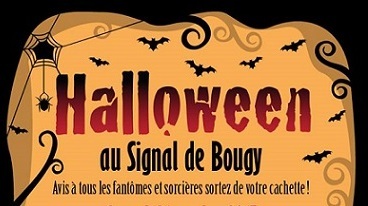 The Halloween celebrations at Signal de Bougy will take place on Sunday 30th of October and will include a free witch’s show, mini kids disco and a kids’ parade through the park. FREE ENTRY to all activities and no advance booking necessary. The event will run from 3pm until 5pm, click here to see the full programme. Monday 31st October 2016: Trunk or Treat, a great idea to take your little ones trick-or-treating in a safe, enclosed environment in the parking lot of the St. Jean-de-Gonville primary school (Pays de Gex, nearby France). 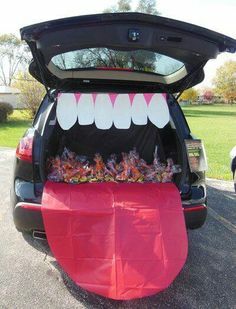 Join a group of parents for a fun evening of trick-or-treating from the boot of your car: but remember, the car must be made to look scary too! If you’d like to take part, this is the doodle poll to confirm your place in the 2016 St. Jean-de-Gonville Annual Trunk-or-Treat. Please reserve your spot by adding your family name and the number of children in brackets. Don’t forget that a minimum donation of 5 euros is required to attend the event. The maximum number of cars allowed is 55, so make sure you reserve your place on the doodle poll by Friday 28th of October! 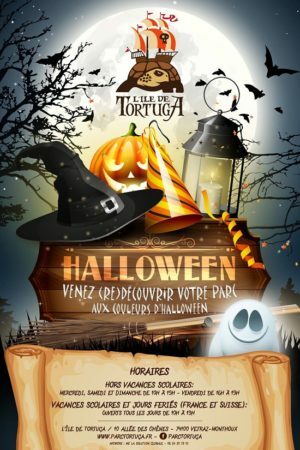 Monday 31st October 2016: Halloween à Tortuga, great indoor party at L’île de Tortuga play centre in Vétraz-Monthoux (France). The park will be open from midday to 9pm with scary treasure hunts, face painting, haunted house and buffet!